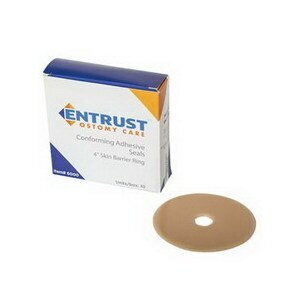 The Fortis Entrust conforming adhesive seal skin barrier rings are formulated to handle high, liquid output as well as thick, heavy output. It gently hugs the stoma and creates a seal that expands when exposed to moisture to fill the empty space between the appliance and the stoma that can create leaks. Because stoma size changes even throughout the day, the rings help maintain the seal for added security and user confidence. Specially created to be less sticky but more tacky to create a good seal without unnecessary mess and residue on fingers. Three sizes to meet changing needs of the ostomate. Helps minimize leaks due to "pancaking"